Well, that Nokia/Microsoft news went down pretty much exactly as I predicted it would. I am a little surprised that Microsoft didn't also get Here, the mapping business. I think Here would have made a nice addition for Microsoft, to compete with Google Maps. Here's what I predict should happen next, or at least what I've been telling everyone to do WRT the cellular industry. Microsoft should set-up an MVNO with a purely data service. They should then set-up their Skype business as the voice carrier on that network, giving everyone a skype-in number. Then every subscriber on this network would have free calls between subscribers, free calls to other Microsoft Windows customers, free calls to/from other Skype customers. Using skype-out their subscribers would also have low cost calls to anyone not covered in the above list. There, that wasn't that complicated was it. You should expect my prediction to become a reality once those following me at Microsoft read this post. Actually, I interviewed at Skype a couple of years ago. They were trying to get me there to work on a companion device for Skype. I was convinced they (Microsoft) were going to do what I propose here. I gave them too much credit. Took a ride along the Guadalupe Creek Trail. Got to Alviso, expecting to have brunch there, but apparently the whole town of Alviso decided to close for Labor day. So we made our way back to Prolific Oven. The ride goes through some nice scenic areas alongside the Guadalupe river. However, it also goes through some dubious areas with the occasional homeless encampment. 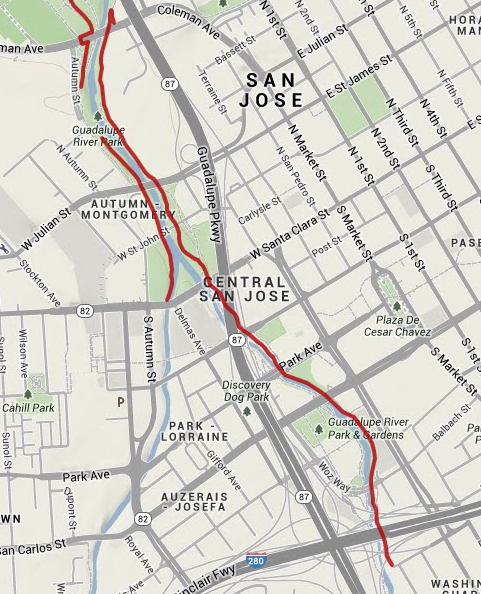 It also goes through downtown San Jose and past San Jose International Airport (SJC), which is fun.